Counting is an essential skill that every junior should learn from an early age. We already have a handful of counting apps on the blog, but we still hope to find more of them to enrich our juniors' learning experience. Today, we bring you one of our latest findings: Farm 123, an interactive 3D pop-up book for toddlers and preschoolers to learn counting. Farm 123 is an interactive 3D pop-up book that helps juniors learn to count from 1 through 10. Just like a real book, you can turn the pages of the app to reveal fully interactive pop-up scenes. The first ten pages focus on learning numbers 1 through 10, while the last seven reinforce the concept through fun mini games. In the counting pages, you help the sassy Farmer Jo round up her animals by tapping on them one by one. The number of animals on each page reflect the number that you are currently learning. For example, the first page has one cow, the second has two horses, the third has three sheep, and so on. As you tap on each animal, the app shows and pronounces your current tally. At the end of the count, the animals will perform a charming animation to entertain you. You can then turn the page to begin with the next number in the sequence. When you have gone through the counting pages, you can test your grasp of numbers by playing the mini games at the end of the book. There are seven mini games in total, and in varying ways they ask you catch, find, bathe, and even pat a specific number of animals. It is interesting to note that the games have multiple levels, so they get progressively harder over time. In the early levels of the bathing game, the animals stay put and wait until you finish cleaning them. But in latter levels, they move around the screen, so you have to follow them with your fingers. Another example is the patting game, where you are asked to tap on a specific number of animals before they disappear into the bushes. In early levels, there is only one kind of animal to pat. But as you progress throughout the game, more are added to confuse you. To reward your effort, the app presents you with a star of different color for every completed level. Each game allows you to earn up to seven stars. When you get to the last level, you can play indefinitely. In addition to learning to count, juniors can also play fun farm-themed mini games. Farm 123 was designed by StoryToys, the developers known for their series of interactive pop-up storybooks based on Grimm’s fairytales. The app is the first in their latest lineup geared towards younger kids, called StoryToys Jr. Besides learning to count from 1 through 10, juniors can also pick up other skills through this app, like recognising animals and colors. The games also sharpen motor skills by asking them to tap, smudge, and drag objects on the screen. 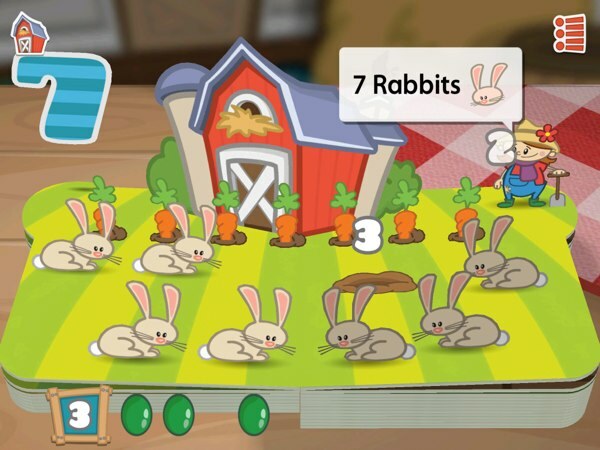 Like most storybook apps, Farm 123 has three playing modes: Read, Autoplay, and Games. In Read mode, you move through the pages at your own pace and participate in the counting activity. In Autoplay, the app turns the pages and count the animals for you, so you only need to sit and observe as it plays. The Game section takes you straight to the mini games at the end of the book. Finally, the app includes a set of professionally recorded voiceovers for eight different languages, including English. It is worth noting that the English voiceover for Farmer Jo speaks with a light Texan accent in the spirit of the farm theme, which may or may not bother some parents. However, the other voiceovers, which narrate the game instructions and pronounce the tally as you count the animals, do not share this accent. As I mentioned before, we have had several great counting apps on the site. But, I have never seen one like Farm 123. The graphics are top-notch and the activities well-designed for the app’s targeted age range. The 3D pop-up scenes are lovely, and I am appreciative that the developers paid special attention to ensure many elements on the page help reinforce the concept of numbers. For example, the app always announces the number that you are learning before and after tapping on all the animals on a page. Another example is the little eggs on the bottom of every page. You begin with zero eggs on every page, but the app adds one for every animal that you tap. I find it interesting that the eggs change colors after the fifth one appears. If your juniors are already familiar with finger counting, the change in colors denote that you have to move on to your other hand to fit the number. Finally, I also enjoy the mini games at the end of the book. I think that they are great to reinforce learning. The fact that they have multiple levels, also extend the app’s lifespan. The mini games have multiple levels to keep juniors engaged. Farm 123 is a colorful, educational, and fun app for teaching your little ones to count. Although the app only covers the numbers 1 through 10, it is worth checking out for its eye-catching 3D pop-up graphics and cute mini games. I would recommend it for juniors ages two to three. Get Farm 123 on the App Store. Note: Thank you StoryToys for providing us with a promo code for Farm 123. It was a really eye-popping app! Little Digits. Unique app makes counting with finger fun. Tally Tots. Learn to count from 1 through 20 with this compelling app. Alien Buddies. Colorful aliens accompany toddlers learn colors, shapes, letters, and numbers.